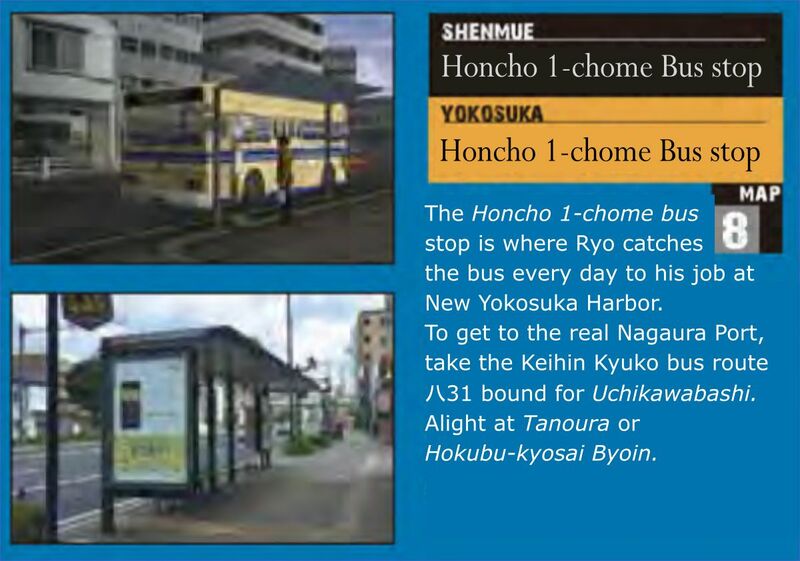 The Shenmue-themed guide map of real-life Yokosuka that was released recently by the Yokosuka tourism board is full of information snippets and photos of real-day locations upon which the game was based. And being produced in collaboration with SEGA, the trivia contained is from the horse's mouth, so to speak. The map is currently available in only in the Japanese-language, and while an English version is imminent, I decided to jump the gun and give blog readers a translated preview of a portion of the pamphlet. The portion we will look at is the real-life map of the route that Ryo takes from Dobuita to the New Yokosuka Harbor in Amihama, where he gets his forklift job. We will be translating the areas of the guide map circled in red. At the same time, we will be able to see how close we got with our speculation and in-game observations covering several previous blog posts, to where the location of the harbor lies in real life. The map circled in the previous image shows a wide-area view of Yokosuka and the general harbor area. I have translated the map, including labels and notes, into English as below (click to enlarge). 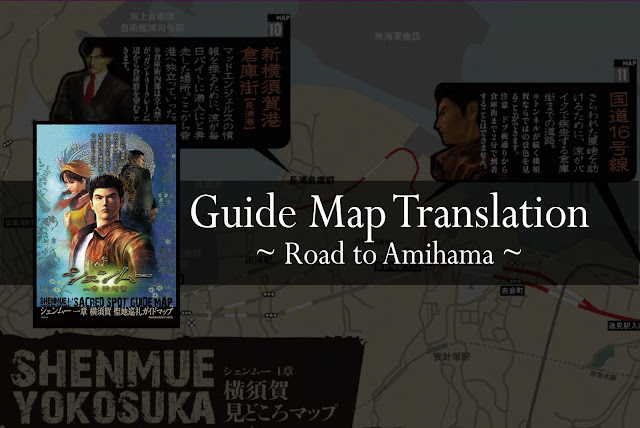 Translated map of Shenmue's Yokosuka. The roads Ryo explored in Shenmue are shown in red. As can be seen, this map confirms our hypothesis regarding the route to Amihama's New Yokosuka Harbor in the game, and that this was indeed based on Nagaura Port! The gray regions marked with "JMSDF" are facilities run by the Japan Marine Self-Defence Force. 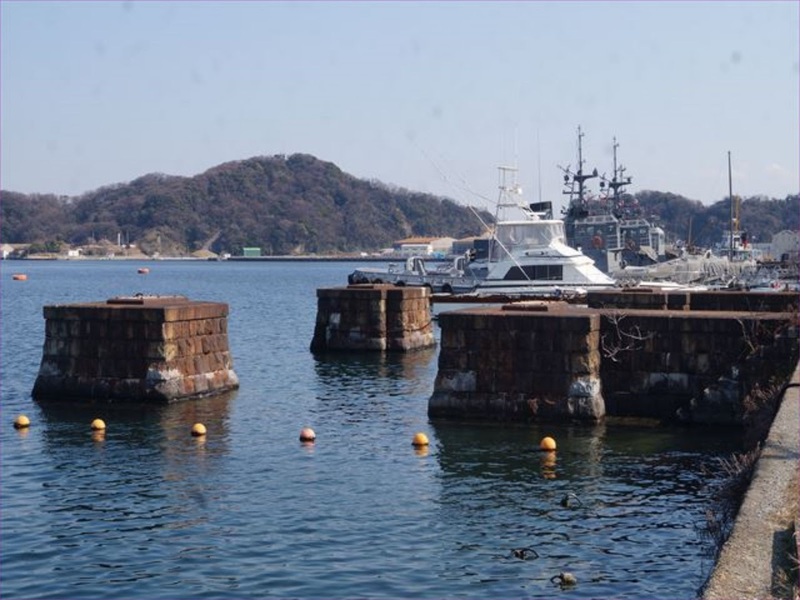 So the warships seen in Nagaura Port (and thus at the harbor in Shenmue) are in fact Japanese vessels. In addition, there are some further notes under the map, translated below. The notes also specify bus route information to reach the location in real life; the names of the bus stops and intersections correspond with those on the map. 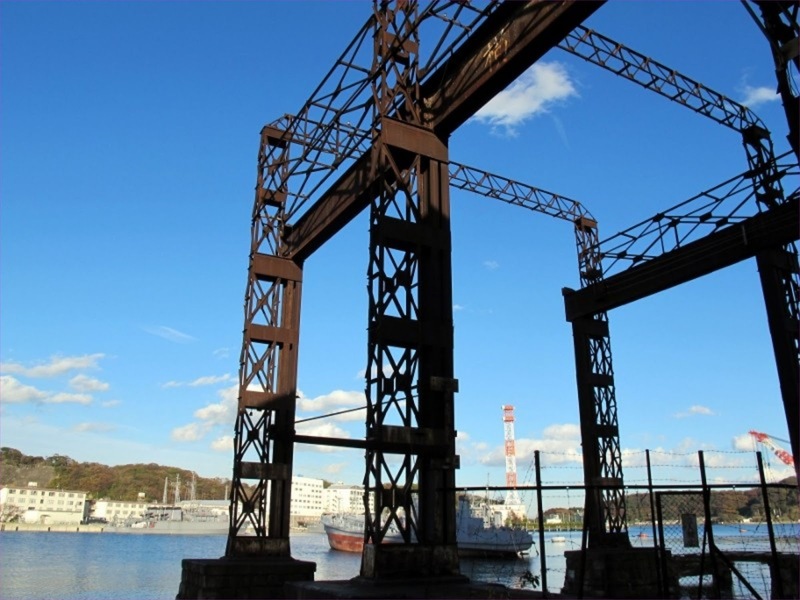 There is also another way to reach Nagaura Port, which is to take the Yokosuka Naval Port Cruise from the location marked on the map (although you cannot disembark at the port). 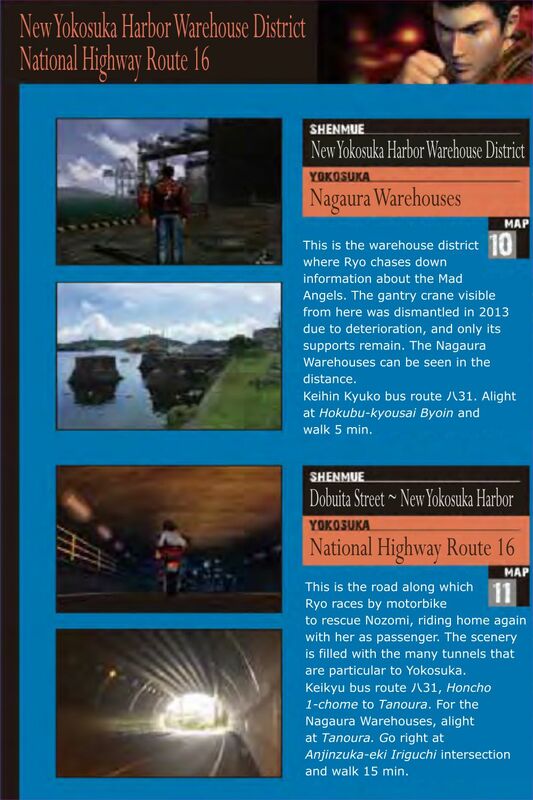 That completes our look at the portion of the Shenmue Guide Map pertaining to the New Yokosuka Harbor at Amihama. I hope you found it of interest. 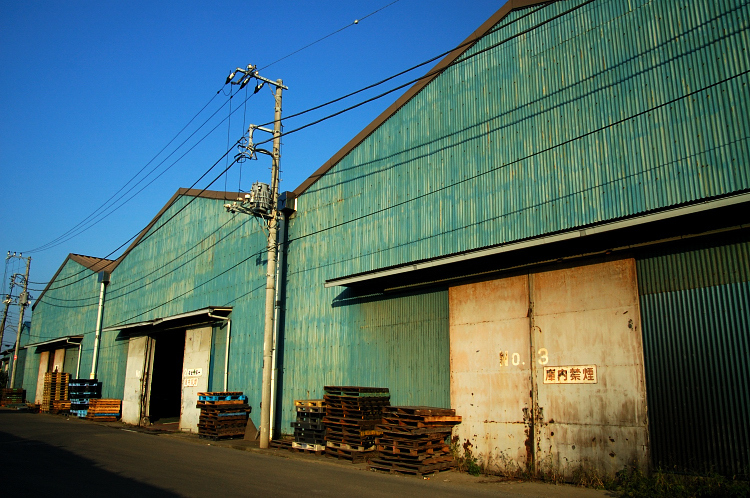 We have a special post lined up, which is an exclusive interview with the Yokosuka Action Promotion Committee - they are the ones who worked together with SEGA and created the Shenmue map. We asked them who came up with the idea to make the map, SEGA's involvement, the process of putting the map together and more. Watch out for it soon!